This is Fahtz with glittered nails, a handmade bracelet and an art tiara - all of which she made at the Phoenix Craft Rave earlier this month! 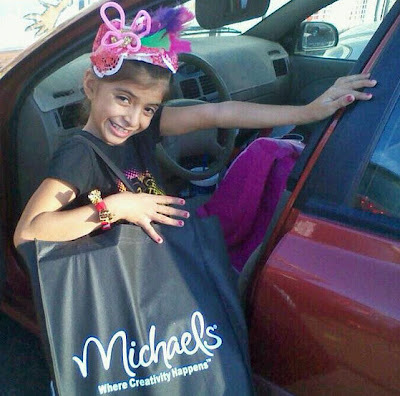 This adorable little girl named Fahtz came out to our Phoenix Craft Rave last month and stayed for hours crafting! iLovetoCreate was one of our sponsors - which meant everyone got a FREE Crafty Chica Empowerment Guardian in their swag bag. Here is a video of Fahtz decorating her guardian - it is soooo cute, it will surely make you smile! And she certainly has the Crafty Chica spirit - from adding lots of glitter to cheetah print trim! Right on! Very creative! I liked how she was so professional, explaining all the steps. Great job! !